The drink first used by priests in pre-Columbian times. Tequila became an item of National pride after the Mexican revolution, the history of tequila is intertwined with the history of Mexico itself.. Thank the Aztec god Quetzalcoatl again for this particular elixer. He was so upset on the death of his wife Mayahuel that the other gods created something to sooth his broken heart. And what a special something it was! The gods gave hallucinagenic qualities to an agave plant growing from the grave of Mayahuel, so that the grief of Quetzalcoatl would be soothed by the pulque extracted from the heart of plant. And that marked the beginning of a long tradition of drowning Aztec sorrows. With Mexico gaining independence in 1821, there was a renewed appreciation and pride in all things Mexican. The now iconic drink became the most popular in the country, as it did again after the Mexican revolution (1910-1920). In this way, it's more than just an alcoholic beverage. It's a symbol of nationhood to the Mexican people. In the same way that only champagne from the region of Champagne in France may carry the name, tequila should only be called so if it is from the town Tequila of Jalisco State in Mexico. The town itself was named a World Heritage site by UNESCO. Formal distilleries were opened in the town from 1758 onwards, blessing the region with a good economy. As a result, there is a great range of Spanish colonial architecture. An international success! More than 715 brands of this hard liquor are drunk around the world. The world outside Mexico must be drinking 120 million liters of the stuff per year. That's how much they export from Mexico these days. But now even China is manufacturing a version, cheekily using labels that are copies of the Mexican ones! Maguey: the botanical source, closely related to the cactus. It has blue-green spikey leaves. Agave: name given to maguey by the Spanish. Agave comes from the Greek word for noble. 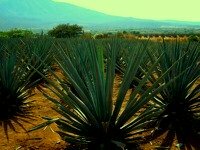 From 300-400 varieties of agave, pulque is sourced from only the blue agave. Pulque: The liquid extracted from the maguey.